Sometimes moving to something new means moving something older – but not too far. That’s the case with the single-lane Fort Nelson River Bridge, which we moved about 10.5 metres in mid-April, to allow for a new two-lane bridge to be built on Highway 77, about 70 km north of Fort Nelson. The existing bridge will serve as a detour while the new bridge is being built. This video shows the existing bridge – a lengthy 430 metres – being shifted over a period of approximately 17 hours. The move took place from around 6 pm until 11 am the next day. The single-lane bridge, with its timber deck and steel frame, was built in 1984 and originally intended to be used for 20 years. It’s one of the longest modular steel bridges built on site, in North America. Now in its 31st year, it will be replaced by a reinforced concrete deck bridge with three lines of steel girders below. The new bridge will be supported by the piers and abutments of the existing bridge, which are being strengthened to hold up the new, higher-capacity bridge. Moving from one lane to two lanes will make the bridge safer and keep traffic moving, by eliminating the need for vehicles to stop and wait for traffic coming from the other direction to clear. Moving the existing bridge over to function as a detour allows this important transportation link to stay open to highway users during construction. Highway 77 connects northern BC with the Northwest Territories, and is an essential route for natural gas, forestry and mining activity. These resource industries use big vehicles to move freight, and need safe and reliable transportation for their products and supplies. The route is also a vital corridor for many First Nations communities, delivering necessary goods and services. 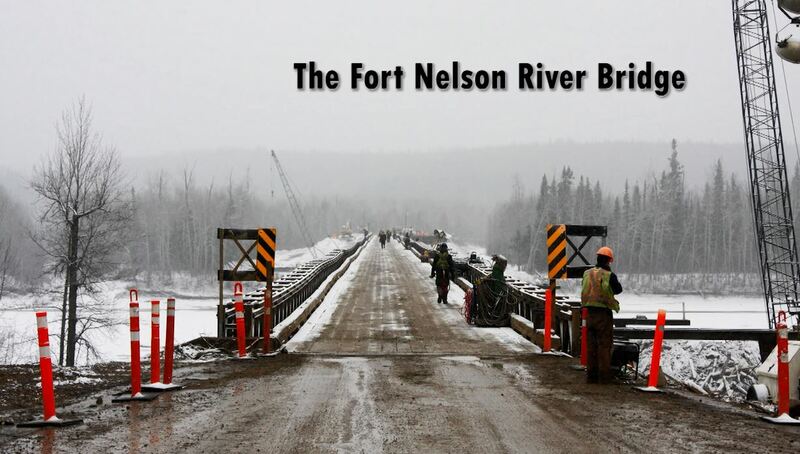 The new Fort Nelson River Bridge is scheduled for completion in summer of 2017. See how relocating the big bridge is a moving experience. To bad the Ministry didn’t mention the company who is doing this amazing bridge Shift and constructing the new bridge. A huge shout out goes to Forbes Contracting for an amazing job. Thanks Andrea and thanks also to Forbes. Great work!